This book is on the reading list for one of my Birkbeck modules this year. The debut novel of a Chilean author, Isabel Allende, and originally written in Spanish, this is an English translation. The style of writing is rich and dense. With a host of eccentric characters, a story line that spans many years and a meandering style that goes off on numerous digressions, it reminded me of the other South American author, Gabriel Garcia Marquez, whose book Love in the Time of Cholera I read recently. Whereas I found the Marquez book difficult to read and failed to empathise with the characters, this book grabbed me almost from the beginning. The story covers the evolution of a family through three generations of idiosyncratic women. 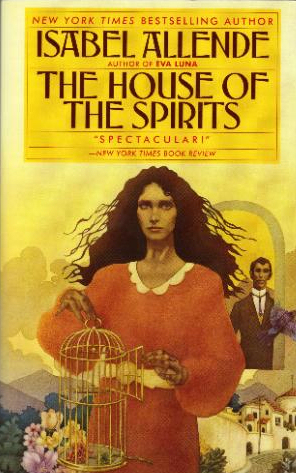 The novel opens with the childhood traumas of Clara, who appears to have mild clairvoyant abilities and is responsible for ‘the spirits’ of the title. The story follows the fortunes Clara and her daughter Blanca and ends with the account of what happened to the grand-daughter Alba. It is set against the changing landscape of a South American country (Chile, we assume). During the long time span of the book, the central family grows rich and powerful, before losing much of its status and prosperity during a time of political upheaval and social change. Opening with an omniscient narrator, the story has a passage where the narrative shifts from third person to a first person account for a brief period and eventually you realise you are reading part of the life history of Esteban Trueba, who is betrothed to Clara’s sister. This shift in point of view turns out to be a great device for securing some empathy for Esteban, who later transforms into an awful brute of a man. Much later, the identity of the true narrator of the story becomes apparent. What I liked about this book: I loved the depth and breadth of the story. The empathy evoked for all the characters – both the likeable and the unlikable – was a real hook for me. The story is magical in places (the spirits and prescient abilities of Clara) and very real in others (the social and cultural inhibitions placed on the women at the time). What I didn’t like about this book: I find it hard to find anything negative to say about this novel. Perhaps it would be helpful to have some sort of chronological chart or scale with which to orientate yourself? But, on the other hand, the meandering style of the book is one of its charms. Pingback: Review: Paula, by Isabel Allende | Gabriela S.